Sheffield TMAU urine test : Back within 2 weeks ? TMAU urine test program (only current UK/Eire test lab). Testing was suspended last Autumn due to technical issues. Should be running again within 2 weeks. The Sheffield test program was begun by retired Sheffield employee Nigel Manning around 1997. Without him, there probably would not be a UK/Ireland TMAU test lab. TMAU might be viewed the 'poor relation' of metabolic disorders, and from a hospital viewpoint may be naturally viewed as 'back of the queue'. Recently this has been changing among the British National Health Service (NHS). Possibly due to 2013-14 government paper about the treatment of rare disorders for adults. For instance, recently there has been the introduction of TMAU group meetings at some UK NHS Adult Metabolism Units. The test program was expected to be back before christmas, It's not known why it has taken longer. Last November there was a community campaign to get the testing restarted, which included contacting politicians. It seems political reps did inquire about it. Possibly this helped a bit. It was hoped that other UK NHS metabolic labs may add TMAU urine test to their list of tests, such as Bristol and Newcastle. At the moment there is no news on this, which is a pity. This would mean the lack of a national test couldn't happen again, and may also drive innovation and perhaps even price. 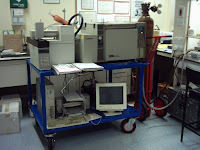 For example, there was talk of the new services using Liquid Chromatography, which is the way most Gas Chromotography tests will go if they can. Sheffield has stayed with Gas Chroma testing for now, possibly due to legacy issues. Hopefully the other labs will not cancel plans to start TMAU testing, thinking it is very rare. More updates will follow. It is likely anyone who joined the email notification option on the SCH website. We will of course notify you here. 1. It could be debated the 'TMAU1' part of the test was too conservative, the 'positive' cut off point working out at around 79% TMAO conversion. Some papers suggest this should be around 90%. 2. It's still a 'closed shop'. with access very difficult to get. The test was last known to be around £137 real price. Most people tend to want to self-pay at test direct. But like most countries, in the UK one needs a 'broker' (e.g. GP). The idea is that people will get the test free through a GP, but GP's don't want to test. That all being said, we are grateful the UK will have a TMAU urine test lab again.